BMW are doing a limited edition HP2 Megamoto for the Japanese market. 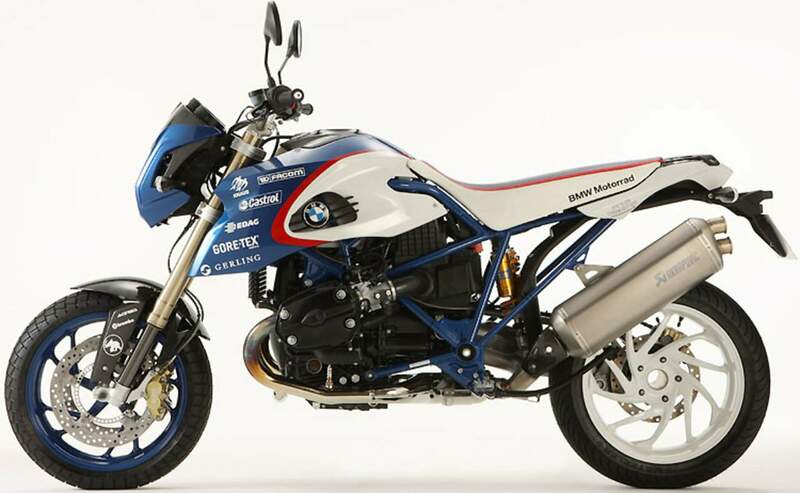 The bike will be a replica of the Megamoto which BMW Motorrad / BMW USA Sierra raced at the Pikes Peak hill climb event last year. Initially, only 40 units of the HP2 Pikes Peak Edition will be built, though BMW may consider building more if there is enough demand. The HP2 Pikes Peak will feature race-replica paintjob and stickers but will remain stock mechanically. The 1,200cc boxer twin will still produce 113bhp at 7,500rpm and top speed for the 199kg (wet weight) bike will be around 200km/h. Thousands of spectators turned up at Saturday's race to cheer on the brave riders and drivers who attempted to scale the 12.42-mile (20-km) course that begins at 9,390 feet (2,862 meters) and finishes at the 14,110-foot summit (4,300 meters) of the spectacular Pikes Peak Mountain. The first half of the challenging course is asphalt, while the remainder is hard-packed gravel. Following a thunderstorm in the Colorado Rockies, the track was still wet and therefore slippery and tricky to ride. "I improved my fastest time from last year by a few tenths of a second and in respect of the adverse conditions I am very happy. I had a lot of fun with the Megamoto on this challenging track," he said. Trachy's team-mate Casey Yarrow was beaming with joy with his second place finish: "I improved last year's time by half a minute, which is really great! In contrast to most of the other people here it was only my second ever start at the Pikes Peak, so with this in mind, I am more than satisfied with my performance this weekend." "I had a great run without any mistakes and I rode more aggressively in every section in the race than I had throughout practice. However my time was still six seconds slower than Gary's... It's totally incomprehensible for me to think about exactly where I lost time because in my mind at least I was really fast. The Megamoto is a great tool for this kind of race and I hope I can show next year that I've got what it takes to win." Greg Tracy, the older brother of the class winner, is also hoping for a better result next year: "It's very difficult to complete all 156 turns without making any mistakes," said the stuntman who won the Supermoto class last year and came third in the overall rankings. 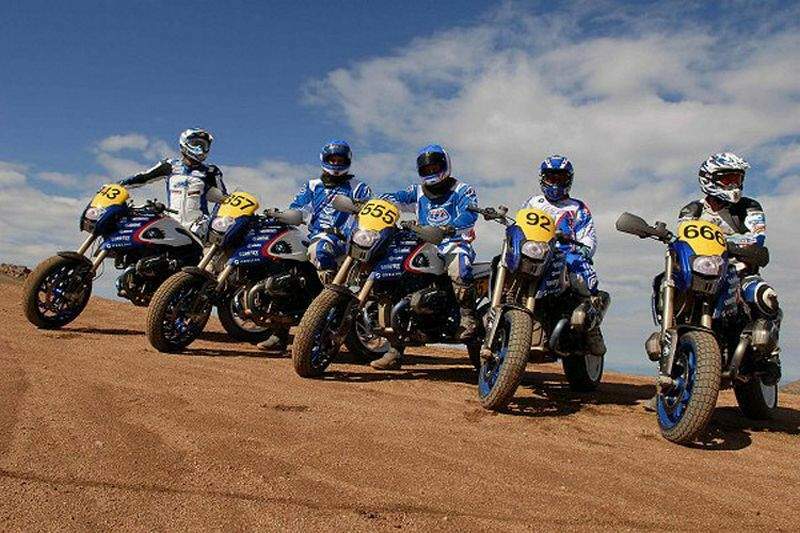 "There are ever-changing conditions on the track, and there is often sand on the asphalt. At Pikes Peak everything has to come together for you to win, but it didn't today for me. However, the bike was not the reason." 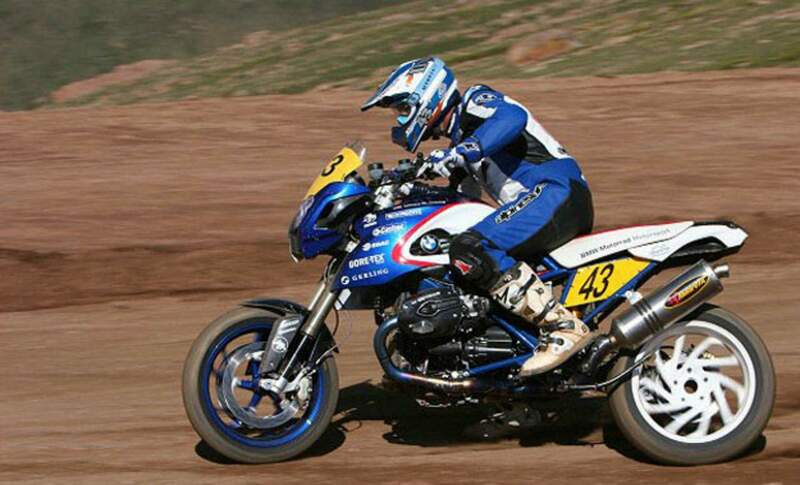 German rider Markus Barth - competing for his first time at Pikes Peak - gained a lot of respect for the spectacular 14,110-foot (4,300 metres) mountain race: "That was an extremely hard race, with ever-changing requirements, and today I couldn't have achieved more," said the BMW Motorrad Motorsport racer who nearly fell twice and was forced to ride a little more conservatively towards the finish. The overall fastest motorcycle time of the day went to American rider Dave Durelle on a 750cc prototype machine that weighed only 110 kg. At only just over five feet (1.55 meters) tall himself, Durelle weighs next to nothing - in fact, the combination of rider and bike was lighter than the weight of the HP2 Megamoto alone! Durelle had a flawless run and made it to the summit in 11 minutes and 41 seconds - just five seconds faster than Gary Trachy on the HP2 Megamoto. Apart from Dave Durelle and the four American HP2 Megamoto riders, no other bike or rider even came close to the magic 12-minute ascent time.